Here's a picture of my nanomaille, shown with a dime to get an idea of the scale. Rings are 1/64" inner diameter and made of 40 gauge wire(.0035"). As far as I know this is the smallest handmade mai... Here's a picture of some welded acrylic maille that I made. A picture of my watch, links are 24g 316L stainless steel in a 6-1 weave. My belt. Dragonscale 16g 3/8" spring stainless steel and 16g 1/4" black neoprene rubber rings. An anodized titanium chain I made. An anodized sheet of Titanium showing the full spectrum of colors that it can be anodized to. The green didn't show up very well when I scanned the image in. A patch of Titanium maille that I anodized. A random sampling of my anodized Titanium rings. A little bit of scale-maille that I made out of pennies. A mobius ball made of anodized Titanium. My signature weave, Trinitymaille. My prototype trintymaille shirt, back view. My prototype Trinitymaille shirt, front view. An anodized Titanium ring, not wound from wire but carved from a block of Titanium and anodized as a finger ring. Given to one of my friends as her wedding ring. A choker made from Titanium that shows the natural finish of the metal A sterling silver bracelet that I made. It's 20g in a 6-1 weave and uses 3 different sized rings to create the wave look. Some prototype scale-maille that I've made. It still needs a bit of work before it's perfected. It's based on the Japanese 4-1 pattern hung on a bias. Maille Graph Paper. You can use the paper either by printing it out or using a paint program. I made it for rings that have approx 4:1 I.D. to gauge ratio and the weave is shown at half stretch. A womans top I made, chest size is adjustable cup size fits DD. Made from 16g 5/16" acid etched aluminum. An interesting hybrid between curb chain and maille. My beloved linesmans pliers. By far the best all around pliers for mailling, I use them for everything from 12g galvy to 24 gauge silver. Some clasps that I made, I spent the better part of a day brainstorming and experimenting with designs for better clasps and came up with these. In order they are called, Theta clasp, Square knot cla... My prototype lorica plumata vest. Details on construction and more pictures are on TRL's site. A scale halter top, nickel plated tempered steel scales and #2 1/2 fine stainless steel split rings. Here's a picture of how I did 45 degree shoulders on my scale vest. This could conceiveably be used to extend some scale sleeves. By request this is a quick graphic showing the construction of my scale halter. The red outline indicates the shape of the piece of scale before accounting for contractions and the circles show the ex... A silver bracelet and necklace I made for my sister with hand made clasps. My first piece of chainmaille ever, lots of sentimental value. 14g 3/8" galvanized. My design to make a quick and attractive toggle clasp out of scraps of wire. This one is made from two pieces of 20g grade 1 titanium about 4" long. A Japanese 4-1 vest I made for a friend. #10 stainless lockwashers and 18g 1/8" copper rings, hung on a 45 degree angle. Front view of one of my chainmaille flowers. // // http://i.creativecommons.org/l/by-sa/2.5/ca/88x31.png // This work is licensed under a Creative Commons Attribution-ShareAlike 2.5 Canada License... Rear view of one of my chainmaille flowers. // // http://i.creativecommons.org/l/by-sa/2.5/ca/88x31.png // This work is licensed under a Creative Commons Attribution-ShareAlike 2.5 Canada License. A ladies evening bag that I made. 24g 3/32" welded stainless steel. My modified knipex 20-160 pliers. They are very fast and comfortable, I've hit 800+ rings per hour with these. They also look awesome. My new belt. 18g Ti rings in e4-1 on a bias with a 45 degree seam running down the middle. Buckle is also Ti and made by me. A titanium ring I made for myself. 1/32" ID in e4-1 on the bias. Even in grade 5 Ti it is very fragile. An Indian style maille and plate helmet, displayed at the Hermitage in St. Petersburg. Full view. Detail of the earplate attachment holes spacing, note the butted repair ring in the top right corner. Detail of maille attachment to lames around temple, spaced at one extra lame per row of rings. There is also a row of doubled rings. They may be solid or split rings and probably result from an earlie... Detail of the crown/temple plate attachment. There is another row of doubled rings, note that they are not repair rings. Attached to the doubled rings are broken rivetted rings. View of the damaged area of the crown, it's hard to say if the damage resulted from combat or neglect but in either case it looks to have been a shearing impact across the rear right top of the helmet... A close up detail of the rivetted rings. You'll notice that every ring has a very similar form as if made in the same die. Each ring is slightly D shaped with an inward facing point at each flattened ... In this view you can clearly see where the rivet has been pulled from the hole that the rivets are definitely round cross section. The shape of the rivet head is not always an accurate indicator. This is the provenance for the helmet in English and Russian. Rear view of the collar showing 45 degree seams and 90 degree seam on the shoulder. Provenance for the shirt in French.Roughly translated it reads: // // "Hauberk with riveted rings "like grains of barley"(?!? )Western, end of the 15th Cent. Iron. Collection of Musee de l"Armee 1... Maille covering the lower torso in a suit of late period plate armour. Close view of maille on late period plate armor. Very worn rings, perhaps with slight traces of die flattening left, wedge rivets. There is a chunk of more modern twisted wire in the picture as well. More maille displayed with late period plate armour. Round cross section rings, hammer flattened overlap, wedge rivets. Rivet heads are very flush and peened side is facing away so they are not visibl... Maille underarmor on late period plate. Provenance for late period plate armours displayed with maille. Full view of late period plate armor with maille skirt. Detail view of Maille in skirt. Round cross section D shaped rings, obviously die flattened overlaps with a perfect inverted point and round rivets. The pictures for this piece didn't turn out well bu... Provenance for late period armour with maille skirt, #3. Very old "ringmaille" these butted rings are woven through cloth. Another sample of very old "ringmaille" this one uses tubelike ring and short coils. This is part of the very lame provenance for the find the "ringmaille" is with. My Russian is crap but it basically just says it's excavated from a byzantine site. This signage was nearby the "ringmaille", unclear if it is directly associated or not. But it seems meant to give a rough date of 4th-5th Cent AD to the displays in that wing. Detail view of Fragments of maille, very corroded. Wider view of maille fragments, it is unclear from the display if the maille can be directly associated with the scale fragments above it. Maille is iron, scales are bronze. Provenance for the find with the corroded maille fragments, maille is not directly referenced as far as I can tell, so only the date is noteworthy. And maybe also the general state of disrepair, typic... Maille fragment, appeared to be bronze, very thinly flattened links, probably by hammer, wedge rivets. Another maille fragment from the same find, totally different construction. Appears to be iron, round wire with flattened overlap, probably hammer flattened and has wedge rivets. Provenance for the find containing the two maille fragments. Really good provenance by Russian standards. Provenace for the shirt, it only says "chain byrnie" and "17th century". I spoke with the curator and she said that the shirt and other items in the case were kept by a local family as mementos of a h... This is a closeup view of the vital areas, the riveted rings are still about the same size and aspect ratio as at the hem but look at those thick, small diameter solid rings. I dont know that it helpe... This is the left shoulder of the byrnie, it shows a lot of damage and a range of aspect ratios used. It indicates a lot of use and repair to the armor over a long time. There are several different sty... This is a detail view of maille from an archeological find. Time and corrison have basically fused this shirt(?) into a big solid lump of rust. This is one of the main reasons that maille is difficult to gather historical data on. This is part of the provenance for the rusted lump of metal, I mean maille shirt. I can't really read the title I think it's a family name, it'll have to wait until My GF gets time to translate it. Th... The rest of the provenance for this rusted lump of metal #34 it simply says "chain byrnie" More rusted fragments of maille, they are pretty small but it's probably still a good bet they were a shirt. OK, this is the last piece of crap rusted chunk of maille. I really hope this info is useful to some people. The provenance, once again looks to have some good info but I can't translate it. #9 Detail view of the rings on a very damaged shirt. Flattened wedge riveted rings, no punched rings Full view of the very damaged shirt, simple T shirt construction. This is a detail of the maille drape on the front of the helm. A much more standard size about 18g 3/8" fully flattened rings with wedge rivets. Detail of the attachment of the maile drape on the front of the helm to the oculars. As you can see it has been detached and then reattached with more modern riveted rings, which have since then been ... Detail of the attachment between the helm and the maille drape of the sides and back. This maille has just been crudely shoved onto the helm, the attachment system looks like it was more meant for lea... The provenance for the helm, I'll have it translated when I can but it probably doesn't matter anyways since the maille doesn't look to be original to this helm. Another maille shirt, either a hauberk or a very large byrnie I really can't tell. It's the largest shirt I have ever seen but the proportions are sized like a t-shirt. Detail of the rings, round wire, round rivets. Half punched half riveted ring construction. Most of the rings are badly corroded and very thin. The larger riveted rings are repair rings but still very... A wider view of the area where a large slash has been repaired. You can visually follow the line of repair rings. they seem to have been originally larger and haven't corroded as much over time and us... Closer view of the neckline, it appears to have been a simple rectangular opening with no flap or split down the front. In this area of the shirt several rings have had the rivets corrode out confirming that these are round rivets. The museums "modern" conservation efforts can be seen here, several rings have been attached together with thin twisted tie wire. The provenance, it reads // // #1 "Chain Byrnie // Russia (name of region?) 14th century" Another shot of the shirt for scale next to my GF. This thing is huge, her head could fit easily inside that sleeve. I estimate this was made to fit a 350-400lb man. A pretty standard byrnie, t-shirt style construction, a lace up slit on the front of a simple rectangular neck hole. Detail of the sleeve construction, notice that the end of the sleeve is tapered not square. This seems to have been intentional on many eastern style shirts but it might just be raggedy on this one. Detail of the chest and neck, the lace up split has been crudely seamed shut at some point. Well I'll be damned. That's a half persian 2-1 edging on that neckhole. That's the same way I first made half persian 2-1 ten years ago. The shirt is on inside out so the rivets are all facing inwards but they appear to be wedge riveted. Rings are fully flattened by hammer it appears, full riveted construction no punched rings. Here you can actually see a bit of the backside of the maille with the wedge rivets poking out. Sure would have been scratchy to wear it that way, you'd think the curators should know better. The provenance, it reads #5 "Chain Byrnie Russia (name of region?) 15th-early 16th century" A nice set of eastern style armor with maille on the helm. In this picture you can see quite a few butted repair rings and that the rings are half wedge riveted and half punched solid rings. In this shot notice that some of the ring overlaps have delaminated you can see the extreme thinness of the rings at the overlap, some are as thin as 24g wire. There are old cyrillic characters stamped into the rings, this was the best picture I could get of them. The inscription reads "God is with us". Here you can see the down side of using extremely thin rings, they crumple and bend easily. The construction is pretty standard, rectangular neckhole with a lace up split in the centre. A typical baidana would weigh in at about 12 pounds and about 10,000 rings. The rings are about 3/4" acros... The rings are so wide that they are forced to overlap each other, this leads to an interesting scale-like effect. Another look at the really cool scale effect on a sleeve. There is a split at the bottom of the armor to allow the rider to sit a horse properly. If the armor were shorter and did not need a split it would be referred to as a half-baidana. The provenance of the shirt and mantle in English and Czech. There is some disagreement is scholarly circles about whether or not the details are accurate. An Etruscan maille sword belt in the bronze room at the Louvre. A shot showing the general construction of the belt, it was difficult to get good photos. A decent shot of the weave construction. Detail of the attachment method, tiny little S hooks. Hanging rings are punched, connecting rings butted. Close up showing the scale like hanging rings. These are very similar to one of my own early scale prototypes. The provenance of the sword belt which was kindly translated for me by Black Widow whose English is way better than my French. // // "Italic sword belt // // 4th century B.C. // // The lower ... A duelling gauntlet, note that the maille and steel plate reinforcement is on the palm side of the glove. These were used to block and trap an opponents blade. A close up of the maille and plate. the maille is very fine approx 22g round wire with what appear to be round rivets. I.D. of the rings is probably about 1/8". The provenance of the glove roughly translated from French; "Gauntlet, used for dueling, Italian 16th Century, cloth, leather, chain and steel frets. This is a quick graphic showing the basic unit of orbital sheet weaves, both thunderstorm and orbital sheet start with this unit and expand it. A collar prototype for my cat, made from scrap anodized Titanium. Rings are approx. 22g 3/32" The text reads "Halp! I is lost, pleez call hoomanz!" and the phone#(obscured). European 6 in 1 is one of the simplest sheet weave progressions of European 4 in 1. In it, each ring passes through six others, creating a denser fabric, depending on the ring aspect ratio used. The minimum for this weave is an AR of 4.3. The sample displayed uses stainless steel rings made from .063" (1.60mm / 16 SWG) wire wrapped on 9/32" (7.14mm) mandrel. With a measured ID of .311" (7.90mm) these rings bear an AR of 5.0. Click here to see a picture of this weave at different biases. Even more dense than European 6 in 1, European 8 in 1 is great for things that require more stability in standing on their own, including basket sides. Also sometimes referred to as 'Serpentine', or just plain 'Spiral'. The Spiral 4 in 1 weave will unspiral itself unless it the two ends are pinned down while the weave is in its twisted, spiral configuration. If you untwist this chain, you will see that it is in fact two interwoven 2 in 1 Chains. 4 is the logical minimum AR, as at this AR, 4 wire widths fit perfectly inside each ring. It can be woven lower than this, but it causes bunching. The weave can't be made below ARs around the 3.2 - 3.4 range without the rings locking into place which thus creates Jens Pind Linkage. The Flower weave is constructed of 3-ring Mobius Balls connected in series by 1 or more connector rings. The sample shown uses .062" (16SWG / 1.6mm) aluminum wire, wrapped on a 7/32" (5.56mm) mandrel. The rings have an AR of 3.9 after springback is taken into account. This is a basic standard Orbital chain with the non-orbiting rings tripled so that the orbiting rings are held solidly in place. This is a weave by lorenzo. This is the Inverted Round weave with captive rings trapped inside the chain. Part of the Orbital/Captive family. This is a weave by lorenzo. A Persian chain made from Half Persian 3 Sheet 5 in 1. It has a natural spiral to it. This is a weave by lorenzo. A Roundmaille style chain made from Half Persian 3 Sheet 5 in 1. This is a weave by lorenzo. This weave flips over depending on how it is held, it resembles a chain of dominos falling over. This is a weave by lorenzo. A Byzantine chain with captive rings trapped inside each of the cages. This weave is a member of the orbital family. This is a weave by lorenzo. Rosemaille is a european weave made of interconnected coif tops. This is what happens when you spiral all the links in Full Persian 6 in 1 weave. This is a weave by lorenzo. This is a variation on Birdcage/Byzantine/Birdsnest that uses 3 ring rosettes inside the cages. Flowers in Cages is a weave by Baealiel Dreamseeker. This is just a variation on European 8 in 2 with two different sized rings that produces a very nice scaled effect. King's scale is a weave by Baealiel Dreamseeker. This is a variation weave which combines Full Persian 6 in 1 and Byzantine (AKA Bird's Nest). Nested Persian is a weave by Baealiel Dreamseeker. This is the sheet form of Turkish Round. Unfortunately it is not very stable and tends to curl upon itself. Turkish Sheet is a weave by Lorenzo. The Half Persian chain with each unit spiraled. This is a weave by Lorenzo. European 5 in 1 is a weave by Eric Matwe (Lorenzo). It is fairly dense and forms a crosshatch pattern. Tiamat Scale is a weave by Tor. This is a variant of Dragonscale with three different ring sizes instead of the normal two. A fairly simple weave combining elements of Japanese and Persian weaves. Here shown using 1/4" 16 gauge galvy and 1/8" 18 gauge stainless. In this ring size, it is quite stiff. It could probably be made into a sheet the same way Japanese weaves are sheeted. Stairstep is a weave by Derakon. Alienmaille is a weave by David H. F. Coder (Knotlinks). Rosettemaille is a weave by Eric Matwe (Lorenzo). This weave forms six petaled 'rosettes'. It is woven by connecting three ring Mobius Balls. Agent Of Insomnia is a weave by Thexnihil. Make Box Chain, spiral every link. This one gets tough no matter the ring or gauge size in my experience. Evil Mr. Stitches is a weave by Thexnihil. This one is easy to make, although tough to give instructions for. It's made from 1/2" and 5/16" links. The big links are spiraled through the links before them. The little links hold them there. Double Half Persian Spiral is a weave by Thexnihil. Start with Full Persian 6 in 1, spiral every link (put it through the link that was before it on the same side). Best results with 18 or 19ga 5/16"id. X-weave is a weave by Thexnihil. This weave is the only one I've found that actually forms an X. To make it, start with Half Persian 4 in 1, and then start doing the links like -_-_-_ on each of the 'chains'. I've had best results with 5/16" ID at 18ga. Picture submitted by Zlosk, with an AR of 4.6. Dimensions for the rendering came from triginometry and real life measurements. Ed. note: Above an AR of 4.5 the weave remains stable, but has a layer slip issue beginning from open chain ends, similar to high-AR JPL chains. This can be overcome either by weaving closed loops, or by finishing a Forars Kaede chain's ends with at least four lower-AR rings. A Byzantine variant of Orchid. Six Leaf Clover is a weave by Nihm. Expanded Counterspiral is a weave by Zach Cole. This is what happens if you reverse the curve of the trough of any Counterspiral every row. It is similar in many ways to the expanded Half Persians and the European weaves. This is a 6-in-1 sample, but all of the other variations are possible with the right size rings. Round Counterspiral 5 is a weave by Zach Cole. Make a chain of regular Spiral 4 in 1, twist it the "wrong" way. That ugly pattern repeats and can be expanded sideways. It will curl up into a trough and you just join the sides together to form a tube. The original 4-in-1 spiral has 2 rows, I added three for a total of 5, but others are possible. Round Counterspiral 4 is a weave by Zach Cole. There are several ways to look at this weave, basically make a Spiral 4 in 1 and twist it the "wrong" way. Next, expand it sideways and it will curve into a trough. Join the trough sides to form a tube and you are done. The first spiral is the first two rows, this has two more added(hence 4 row...). A weave by Eric Matwe (Lorenzo). A weave similar in appearance to European 4 in 1, but constructed entirely of Mobius Balls. Virtually any other weave style can be duplicated using this method. Double Half Persian 6 in 1 sheet is a weave by Aderamelech. This is the sheet version of Double Half Persian 3 in 1. With all but the largest ring sizes it is very dense. It also has an interesting bi-directional curve to it, pulling up around itself vertically and horizontally. This makes it a good weave for building three dimensionally. Half Persian 3 in 1 Column is a weave by Aderamelech. Similar to European column weave, but with Persian. The effect is rather like three strands of Three Quarters Persian connected around one another. A bit bulky but very attractive. Another weave with useful sculpture applications. Half Persian 3 Sheet 4 in 1 allows a change of "cell direction" in adjacent half persian chains. It offers better flexibility than the other sheets, but the back of the sheet lies unevenly, limiting it to mostly decorative or joining functions. Half Persian 3 Sheet 5 in 1 gives the same open appearance as standard Half Persian 3 in 1 chain, with a better range of motion than Half Persian 3 Sheet 6 in 1. The back of 3 Sheet 5 in 1 lies flat, making it very good for straps and other fabric roles. Mobius Spiral is a weave by Green Noise. It is the spiral weave with little Mobius Ball units for rings. Y-Weave is a Persian variant by Aderamelech with some similarities to Full Persian 6 in 1 Grizzly. Unlike many other Persian chains this one works well (perhaps even better) with rings of a smaller ID. Chains of this style made from huge rings are used by the Japanese to direct the flow of rain water from their roofs. Japanese 6 in 1 Box Chain is a weave by Aderamelech. This is made using the same theory as standard Box Chain, namely taking a strip of weave three units wide, and closing it off with a fourth row. In this case however the units are horizontal rings in a Japanese 6 in 1 weave. The box made this way has more open space in the middle then a European box, and so doesn't lay flat as well, but looks great as a hanging chain. To make this chain start with a standard 4-in-one rosette with only four links. Then continue it with no expansion rings. This will force it into a chain. Persian Box is a weave by Thomas d'Cherbourg. Inverted Round is a variant of Roundmaille with the grain at a 90 degree angle. Turkish Round is a weave by Maillemaster. It is a Byzantine/Roundmaille variant. Nice if made with small rings. Puppy Dog Eyes is a weave by Thexnihil. To make this start out with 4 closed links. Stitch them up European style on each side. That becomes the main 'things'. Then, just connect them together. Boxmail is simply interwoven Box Chain. Many variations are possible by altering the direction of the rings in the chains. Byzantine Web is one of the ways to turn Byzantine into a sheet. It works with any ring combination that works for birdcage. However, if more than three chains come together at any intersection, it's a good idea to use larger connection rings to avoid bunching up of the weave. A three in one persian sheet weave, it can be used with very small ring diameters and makes great armour. Trinitymaille is a weave by Eric Matwe(Lorenzo). This is standard European 4 in 1 with the rings laying in three planes instead of just 2, effectively spiralling the weave. Maille With a Twist is a weave by Eric Matwe (lorenzo). European 4 in 1 spiraled into a tube. Works best with small inner diameter rings. Here's a version of European 3 in 1 made by alternately contracting and then expanding European 4 in 1. This is a weave by lorenzo. Also known as "Italian" Maille. 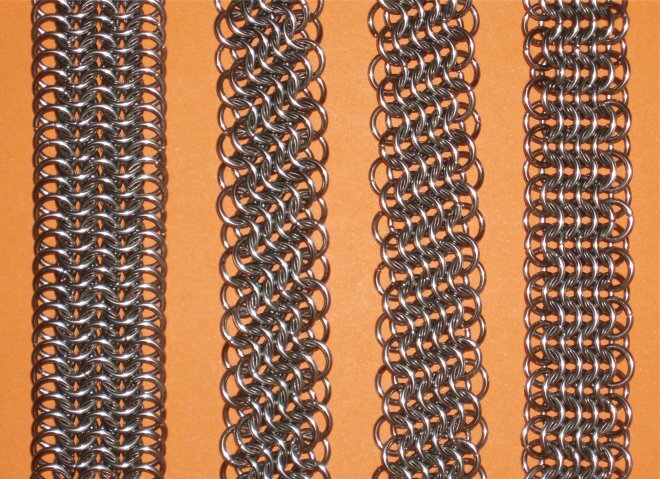 This is the oldest known maille weave dating back to the 7th century B.C. It was historically used for feminine apparel and later armour. It predates European 4 in 1 by at least two centuries. This weave built only of 1-2 chains is the sheet version of Orbital. Every ring in the weave is both orbited and orbiting. Orbital sheet is a weave by lorenzo.